Rome—the capital of Italy, once the capital of the Roman Empire, and today one of the world's most popular tourist destinations. Rome can be absolutely beautiful to visit during the holiday season (see my article below on that subject), but it's not always possible to get there during that time of year. But maybe you recently enjoyed a wonderful vacation in Rome, and want to mark the occasion with a decorative Christmas ornament or two? 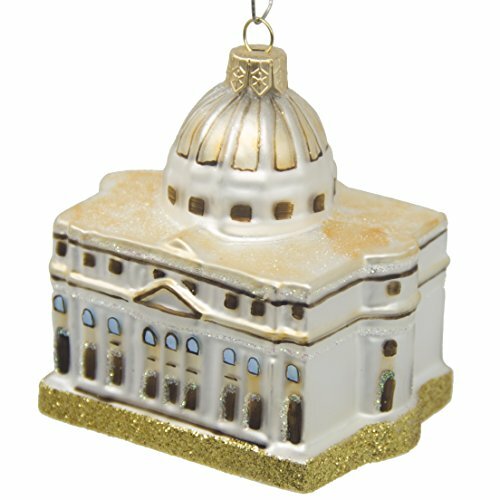 There are some wonderful and whimsical ornaments to choose from, showcasing the city's most recognizable landmarks and attractions. Here I've collected some of the designs currently available I especially love...and you can compare them with my photos of the "real thing"s to see what you think! Welcome to Rome...a city like none other! 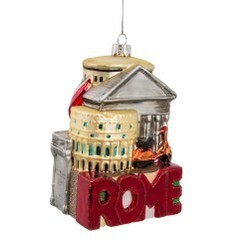 Start off your collection of ornaments celebrating Rome with this one to really showcase how much you love the city! This LARGE Kurt Adler design (6" in height) will definitely stand out on your tree and make for a great conversation piece. Made of painted, glitter-coated glass, it's got designs on all sides showcasing the highlights of the city: the Colosseum, the Pantheon, the Arch of Constantine...even an Italian Vespa motorcycle! It's as bright and big and bold as the city of Rome itself. These Kurt Adler cityscape ornaments are great collectibles and make for great gifts for a world-traveler, too! The Colosseum is perhaps the single most instantly recognizable image of Rome to most. This oval-shaped amphitheater is the largest ever built, and in its time (it was constructed between 72-80 AD) could hold upwards of 50,000 - 80,000 people. No visit to Rome is complete without a stop here, whether to tour the interior or simply to marvel at the grandeur of its ruins today. 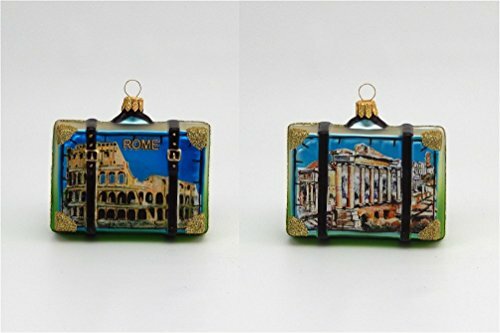 These two glass ornaments capture the image of the Colosseum and are great mementos of a trip to Rome. One showcases the Colosseum all by itself (though it almost looks like it's filled with snow! 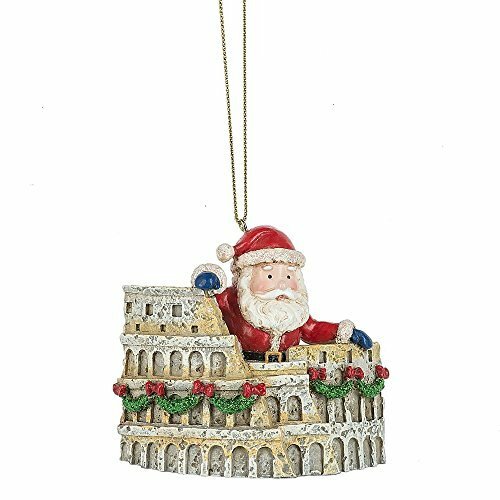 ), the other shows the Colosseum draped in Christmas boughs and with Santa Claus peeking out from inside. The Pantheon was once a Greek temple, which then became a Christian church. Built two thousand years ago, it still has the world's largest un-reinforced concrete dome, making it an architectural marvel to behold. Two kings of Italy are buried here, along with Queen Margherita and the great Renaissance artist Raphael. 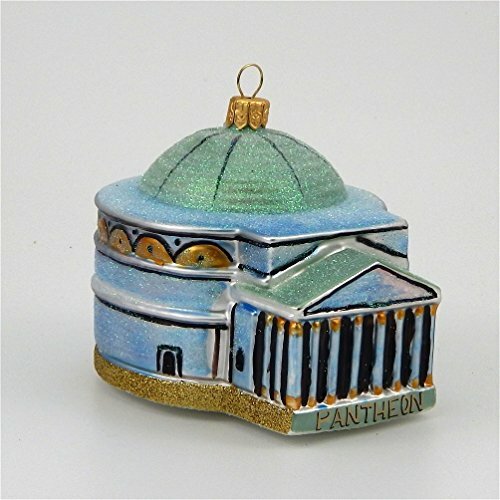 You can keep a memento of the Pantheon on your Christmas tree with this pretty, sparkly glass ornament. About 4 inches in size, it is mouth-blown and hand-painted...making each ornament truly unique and collectible! Every year, countless pilgrims come to St. Peter's Basilica, whether to simply marvel at this beautiful Renaissance church or to attend a papal audience with the Pope. Curiously, while St. Peter's is the papal enclave of Vatican City in Rome, it is neither the actual mother church of the Catholic faith nor the cathedral of the diocese of Rome. Nevertheless it is considered one of the holiest churches within the faith as it is located over the burial site of St. Peter. 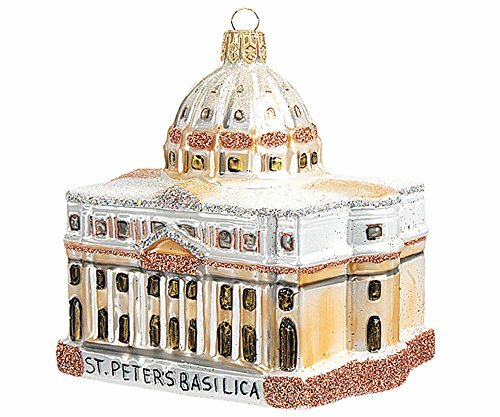 These two glass ornaments both celebrate St. Peter's Basilica in Rome. One is more detailed than the other...and the price would seem to reflect the handiwork involved. So you can choose the ornament best suited for your budget and style. What's Rome like at Christmas time? This rectangular shaped forum, or plaza, is site to some of the most important remaining structures of ancient Rome, its government as well as temples of worship. Within the forum you can see and marvel at the ruins of the Temple of Saturn, Temple of Vespasian and Titus, the Temple of Caesar, Temple of Vesta and much more. Visiting the Roman Forum is one of the highlights of my own memories of Rome. It's simply impossible to describe how it feels to spend hours walking through these tremendous ruins, trying to imagine what Rome was like back in the days of its ancient power and splendor. This ornament will remind you, perhaps, of your own visit to the Forum, and is great for any lover of history and historic architecture. One of the most stunning aspects of Roman architecture still visible today are the aqueducts. These structures, which can be found throughout the territories of the Roman empire, were built to provide water from outside to Roman cities and towns for their public baths, latrines, fountains, private homes and businesses. Gravity alone was used to move the water along to various destinations, making them a true architectural wonder. 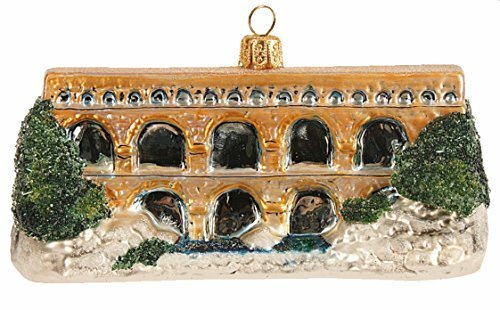 This unique ornament captures the classic design of such an aqueduct, as you might have seen in the countryside outside of Rome. Are you ready to pack your bags for a Rome vacation? Maybe you're planning a trip for the year ahead. If so this cute suitcase ornament is a great way to mark the occasion. 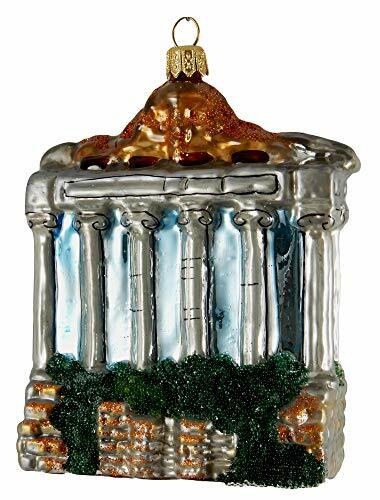 Decorated with an image of the Colosseum along with the Roman Forum, it certainly captures the spirit of the city and its ancient historic treasures. Need help planning a trip to Rome? Did you come home from your trip to Rome with a bag full of gifts—for others or even for yourself? It's not hard to do, when there are so many shops all throughout the city selling souvenirs, designer clothing, handmade leather goods, and delicious food products. 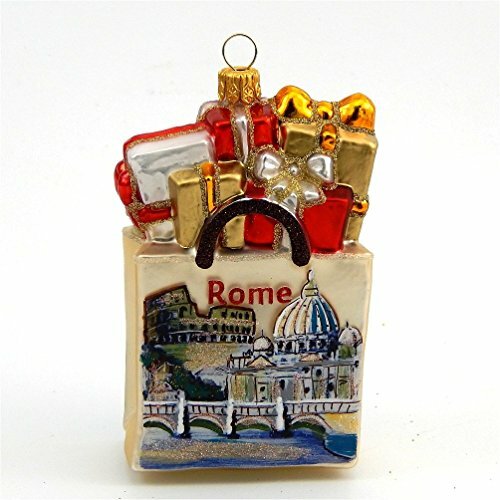 This cute ornament features a glass "shopping bag" illustrated with landmarks of Rome, including the Bridge of Angels which many visitors and pilgrims walk over on their way to visit the Vatican. 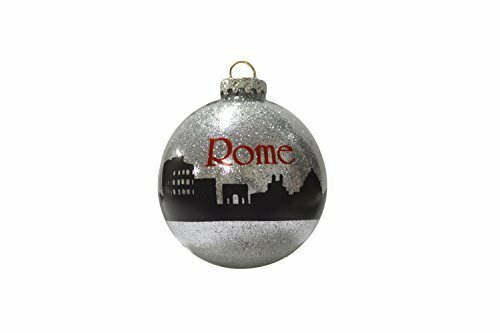 The last ornament I've included in this collection is this elegant round Christmas ball, decorated with some of the famous landmarks of Rome in silhouette. If you try to keep your tree decorations more subtle and unified, this one might be your best pick. Have you visited Venice as well?